Winter air brings dry, dull, flaky skin, and when spring arrives (really, it’s coming!) it’s time to remove old layers of skin to reveal fresh, glowing skin for our warmer months. As we age, the process of skin cell “renewal” slows down. This means that the body is slower to shed skin cells and generate new ones. When old skin cells start to pile up on the surface of the skin, it can leave skin looking dull, rough, and dry. This build-up of dead skin cells can leave us with excess oil and clogged pores, leading to blemishes and acne. Our skin needs some help! How do we do it? Exfoliation. Proper exfoliation removes the barrier of dead skin cells clogging the skin and uncovers fresh new cells below. Not only does exfoliation remove old layers of skin, but it also helps our moisturizers and lotions absorb better, leaving hydrated healthy, beautiful skin. A regular routine of exfoliation will keep your skin fresh and healthy. One thing to consider, however, is that the exfoliation that works for your feet is absolutely not appropriate for your face! 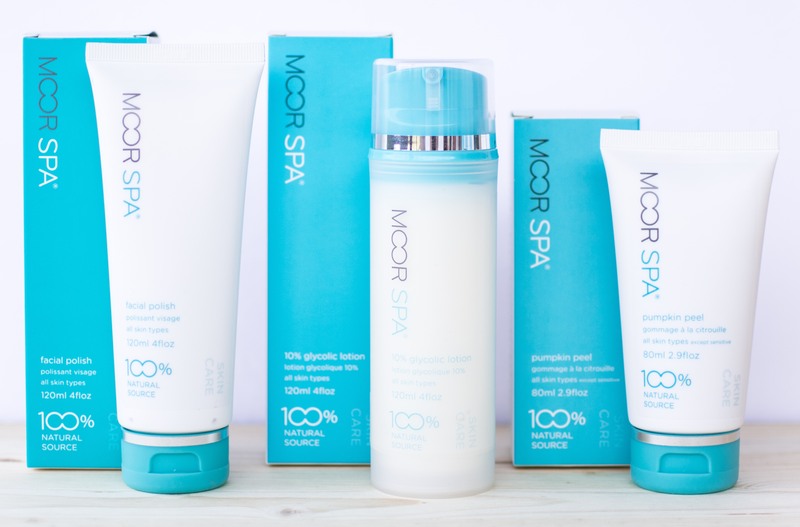 The key here is gentle - choose a physical scrub such as Moor Spa’s Facial Polish. Fine jojoba beads in an aloe vera gel base are safe for your skin, and because they’re not plastic microbeads, they’re also good for our environment. Facial Polish can be used several times a week, right in the shower. For a thorough enzymatic exfoliation (think tiny “pac-man” removing all your dead skin cells), consider Moor Spa’s Pumpkin Peel with enzymes from pumpkin, papaya and pineapple. As part of aprofessional facial protocol, it’s a really effective way to reveal your freshest skin and improve texture and firmness. Skin on your body can benefit from a more vigorous exfoliation, and there are lots of choices available. As part of a beautiful spa treatment, a salt glow exfoliation with Moor Spa’s Himalayan Salt Glow and Complete Oil is applied with flowing, light movements to stimulate lymphatic movement, remove dead skin cells, and leave skin soft and glowing. Take home a Moor Spa Body Scrub Cream with walnut shell powder to recreate the smooth skin feeling at home (or include the Body Scrub Cream in a professional pedicure/leg massage and reduce the likelihood of ingrown hairs between waxing!). One of the most traditional methods of keeping skin healthy and soft is Dry Brushing. This treatment can be blissful all on its own when you’re in spa, or as part of a self-directed treatment at home. Soothing, smoothing, invigorating and healthy, a Moor Spa Dry Brush treatment moves lymphatic fluid, exfoliates dead skin and improves circulation, which may reduce the signs of cellulite. When you’ve removed all the dead, dull skin, embrace the rich hydration in Moor Spa Body Lotion. With no petroleum derivatives, your skin will drink in all the nourishing moisture and leave your skin glowing with health. Oh, our poor neglected feet! After a long winter, we are desperate to feel the warm sun on our toes. Have you SEEN your heels, though? Rough, cracked, dry and flaky feet need our love. The first step to take care of winter-weary feet is to book a thorough pedicure with your favourite esthetician, who will professionally remove dead skin with the Canadian-made Diamancel stainless steel foot file. (The famous #20 is our favourite!). Not only is it thorough, the stainless steel files are fully disinfectable, so you can be assured you’re getting the cleanest, healthiest treatment possible. Once your fresh feet are revealed, help them soak up some moisture with the deeply penetrating antibacterial Moor Spa Foot Cream. If all this seems a little confusing, trust your esthetician to help you choose the right exfoliation for you. Book your appointment to be ready for the warmer weather - we promise it’s coming soon!